After 5 years at Canaletto’s, in 2003 James ventured to Northern California where he managed the kitchen and daily bar operations at the Riverside Bar & Grill in Red Bluff. In 2008, he decided to head further north and landed a job as a Sous Chef at C.R. Gibbs in Redding. Here he was able to unleash hiscreativity with the creation of the “Vintner’s Dinner” program and learn the business side of restaurant management. Ready for a new challenge in 2012, James became the Executive Chef at the Farwood Bar & Grill in the small agricultural town of Orland where he developed a love affair with the wonderful ingredients available from the nearby farms and ranches. James was impressed with the local artisans and by the amount of work that went into creating the flavor of each ingredient used to create his delicious dishes popular with Northern California foodies. In 2013, James moved to Chico where he served first as Executive Chef at the Pour House and later at Johnnie’s where he specialized in “Farm to Fork” cookingusing local products. Working in the rich agricultural region of Northern California has helped James evolve and mature as a chef, developing a personal culinary style with a focus on fresh seasonal ingredients. 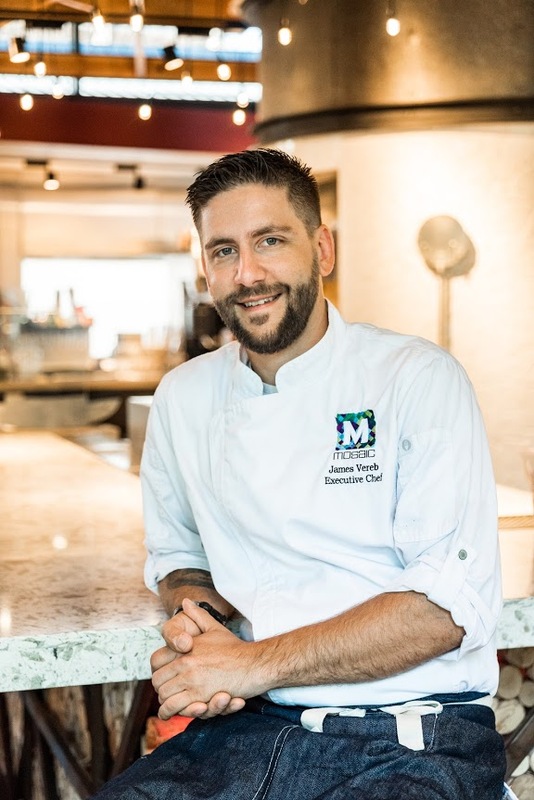 James draws upon his skill and knowledge of local ingredients to create Italian inspired cuisine with a wine country twist for Mosaic Restaurant. The menu includes artisan wood fired pizzas, shareable appetizers, hearty salads and pastas, using local farm fresh ingredients. In his role as Executive Chef, James leads a staff of 30. Together they create delicious food for the 130-seat restaurant, in room dining and catered events.